A new texting deterrent for motorists is included in Assembly Bill 47, which has been proposed by Jim Frazier of Discovery Bay. Frazier said he was partially motivated by the death of his oldest daughter in a car accident. At the current time, if a driver is caught driving and texting, the fine is $20 for a first-time offense. A second offense will cost the driver $50, and other penalties may apply. The proposed new texting deterrent legislation would add a point to their driving record. In California, having four points on a driving record in one year can end up with a six-month driver’s license suspension. In California, a driver who has more than four points in one year, six points in two years or eight points in three years is considered a Class C negligent operator. The California Department of Motor Vehicles carries a list of the point system and types of negligence that are included. When a driver has accumulated enough points, their driver’s license may be suspended or revoked. Also, an accumulation of points against a motorist’s driving record can end up causing an increase in the cost of insurance coverage. Assemblyman Jim Frazier said he introduced the bill to make roads safer by applying the new texting deterrent. His daughter died because a driver crossed over the centerline after hitting black ice and struck the vehicle Frazier’s daughters were in. Although distracted driving did not contribute to the accident, Frazier felt a need to raise awareness of how motorists can hurt others by proposing a new texting deterrent. Kirk Griess, a California Highway Patrol officer, died last August when he was struck and killed by a motorist using a cell phone. The driver was accused of reckless driving and vehicular manslaughter in the incident. Assemblyman Frazier said that he knew Officer Griess. It was his belief that when law enforcement officers begin dying as a result of distracted driving, it was time to step up and formulate a new texting deterrent. According to the National Highway Traffic Safety Administration, distracted driving cost almost 3,500 people their lives and resulted in 430,000 injuries. Texting is one of the most dangerous forms of distracted driving. However, sending and receiving texts while operating a motor vehicle has become commonplace, putting not just the person texting but others on the road in danger. Some estimates reveal that one out of every 20 drivers at any given time are using a cell phone. This increases the risk of an accident. One of the reasons texting is more dangerous than other distractions is that the individual is mentally focused on something other than driving. Commonly called attention blindness, the texter will not always see what is right in front of their eyes because something else has captured their thoughts. Even a single, uncomplicated text requires that your vision is focused on the phone for a minimum of five seconds. Also, the driver must take his or her hands off the wheel to write a text. The AAA pointed out that up to 60 percent of all teenage driver accidents are due to distracted driving. Also, approximately 1,000 people have died due to young drivers who text. Since teenagers are most likely to be texting or viewing a message on the phone rather than engaging in a conversation, this is not surprising. 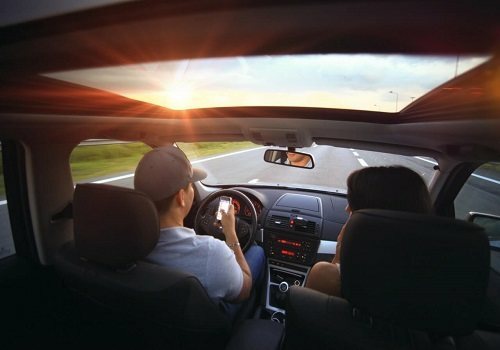 Parents are encouraged to talk to their teenagers about the dangers of texting and to set a good example themselves in terms of using a cell phone while driving. I’m Ed Smith, a Sacramento car accident lawyer. Injuries due to texting are common. At times like these, you need the insight an injury lawyer can provide. Call me at (916) 921-6400 for free and friendly advice. You can use my toll-free line (800) 404-5400 or contact me online also. I’ve helped numerous residents of Sacramento as well as those who live in other areas of Northern California to receive the compensation they deserve after an accident with a negligent driver. Some areas I’ve worked in are all types of car accidents, wrongful death and traumatic injuries among others. I am a proud member of the National Association of Distinguished Counsel. This organization awards membership only to the top one percent of lawyers nationwide who have demonstrated legal excellence in their practice. I am also a member of the Million Dollar Advocates. This is a group of trial attorneys from all over the country who have won more than $1 million for a client.